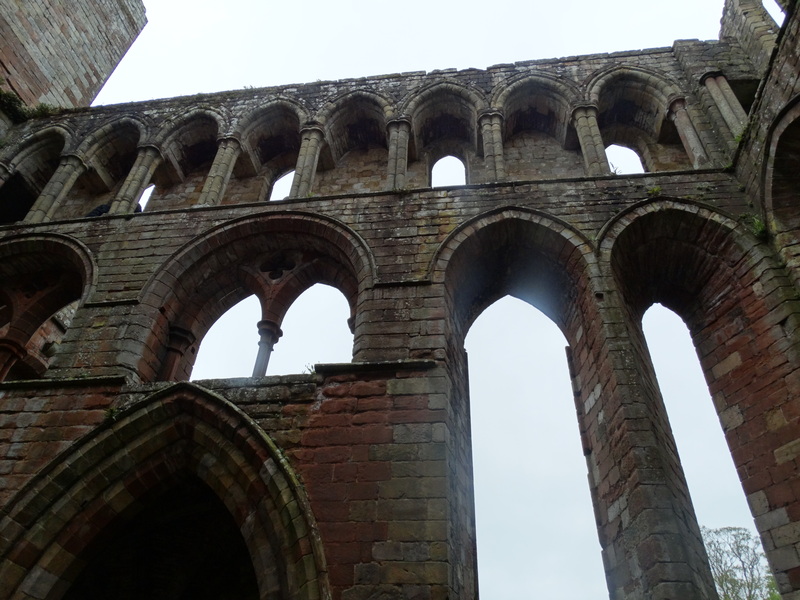 It was never a big monastery, often failing to reach the normal minimum of 12 canons and a priory. The 1536 report said that Prior John Robinson led a community of eight canons and a curate. The priory church had gained parochial status in 1287 and had its own priest by 1314. 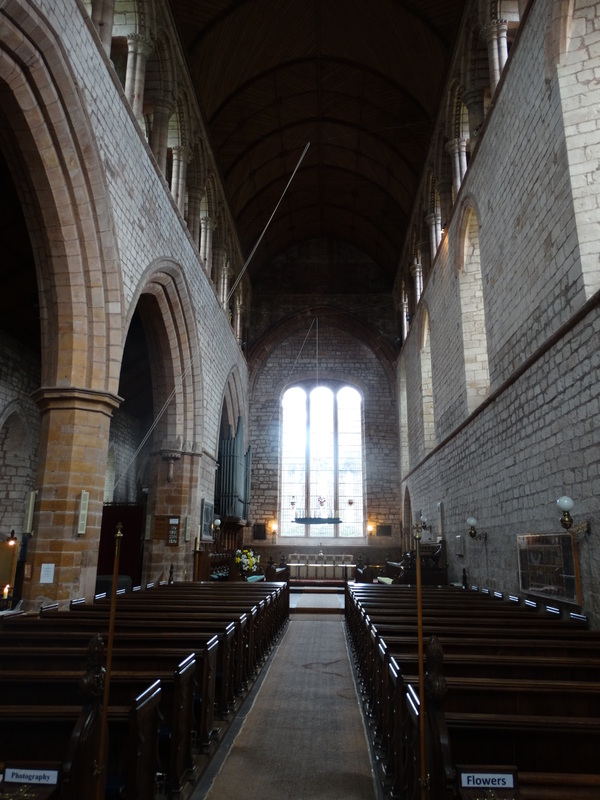 The nave of the priory became the parish church, and this saved it from destruction at the Dissolution. We entered the parish church, and received a good welcome from the volunteer on duty. 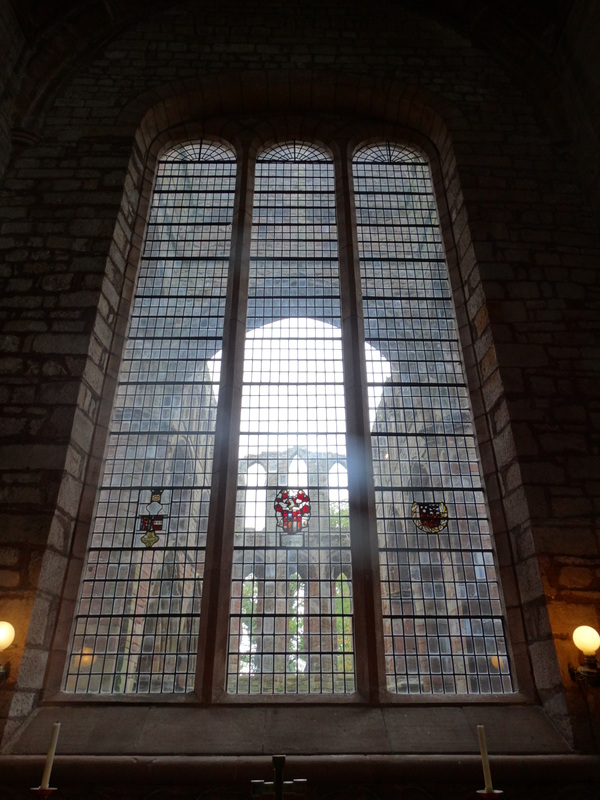 It is a high, splendid church – with a view of the rest of the Priory through the east window. 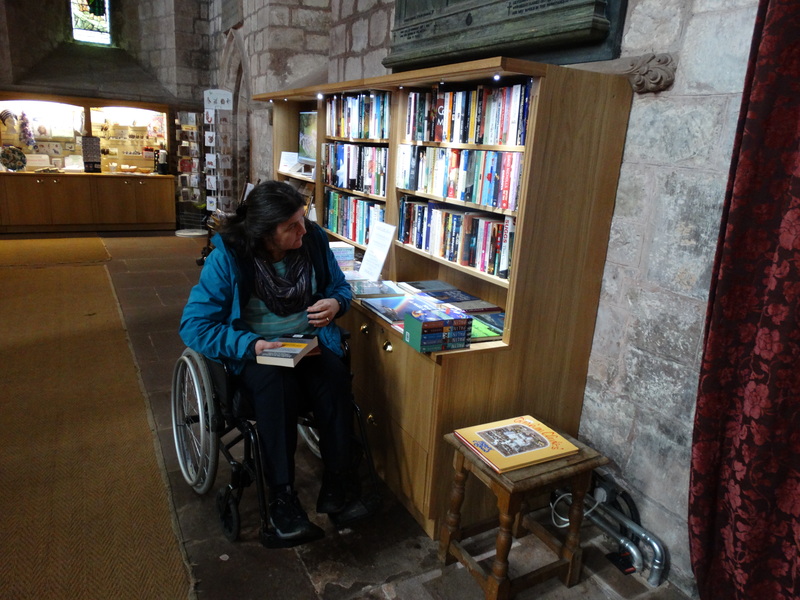 I wandered round while Julie found the second hand book stall. 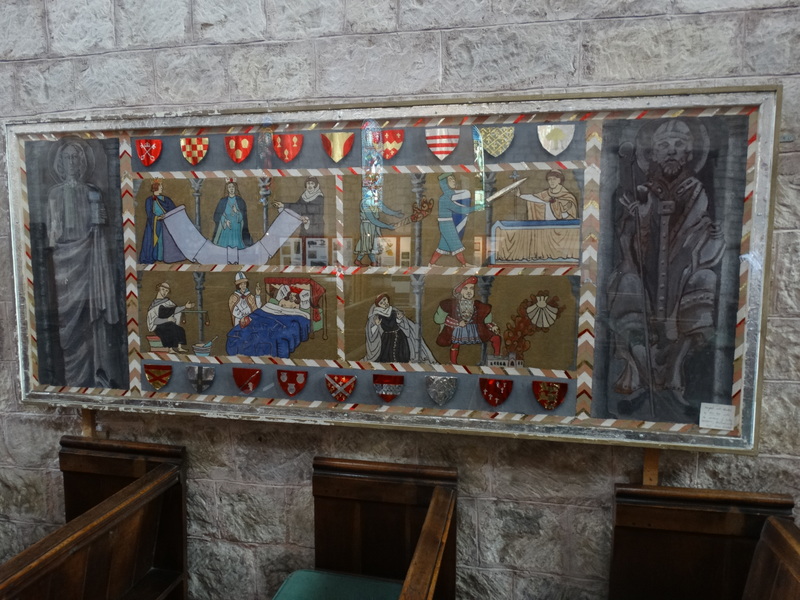 One interesting embroidered panel of the history of the Priory. Edward I visited here in 1306-7 and stayed for five months. He had been in 1280 and 1300, when he had been generous to the Priory, but by 1306 he was 67. He was an old man and his health was poor. He had come north on campaign against the Scots, but by the time he arrived here on 28 September he was being carried in a litter and it was clear he would go no further. Queen Margaret was with him, as were another 200 people. You can imagine the disruption and expense of his visit. He – they – stayed through the winter, not moving on until March. In 1311 Robert Bruce led an army to the priory door. 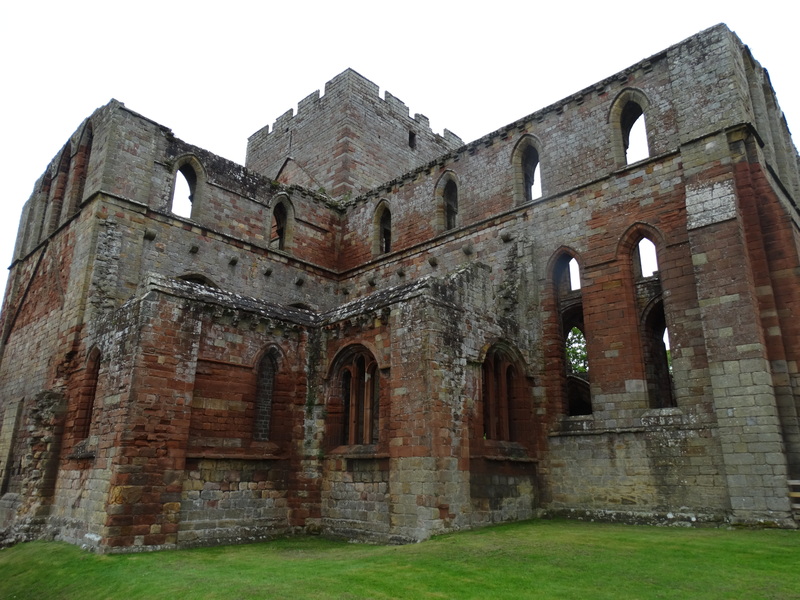 Although the church and monastery were not too badly damaged, they destroyed many of the prior’s other properties. Famine in 1316, cattle disease in 1319, a Scottish raid in 1346, Black Death in 1349 – and so it went on. 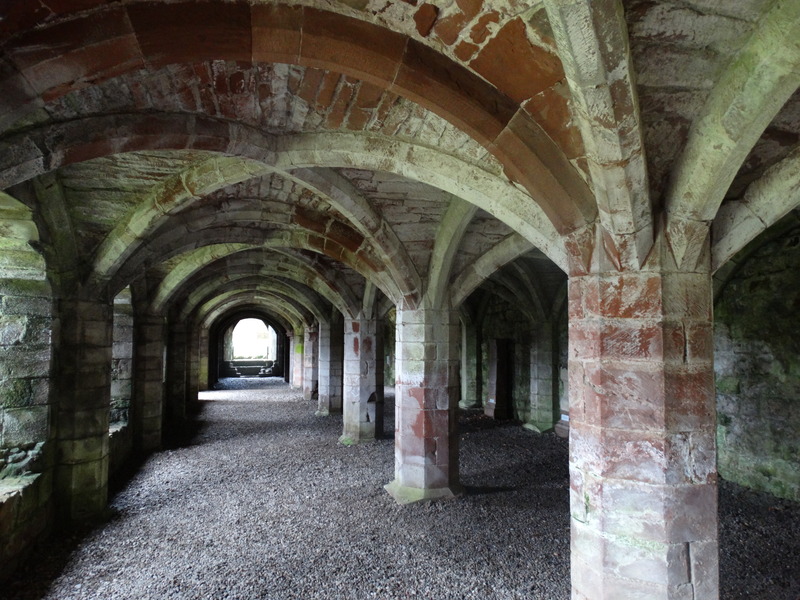 By 1536 the monastery was valued at £85, and closed in 1538. 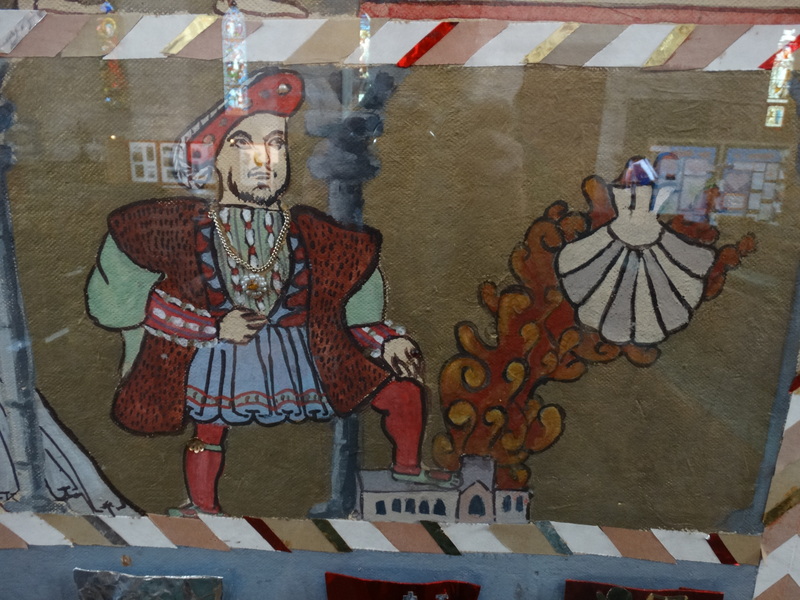 The tapestry shows Henry VIII’s final triumph. 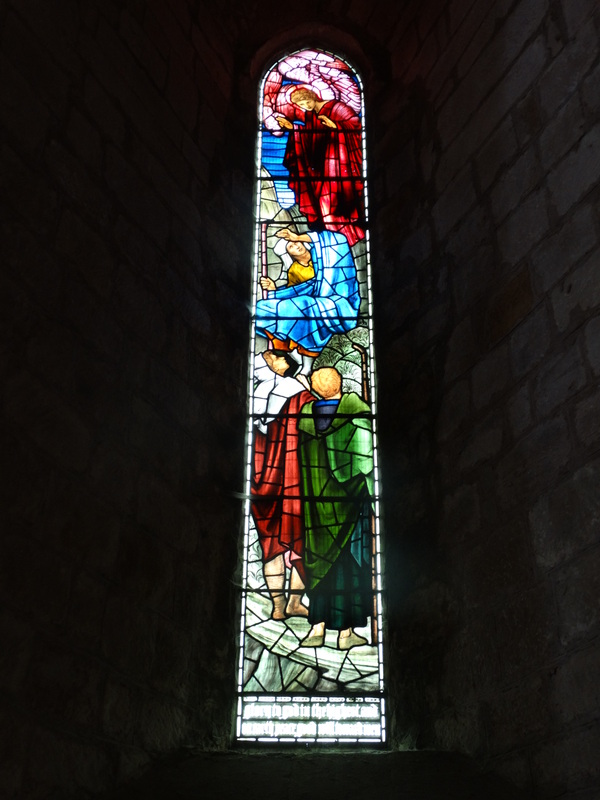 In the late C19 George Howard, the 9th Earl of Carlisle, a philanthropist and artist who lived at Naworth Castle, commissioned extensive work by leading Arts and Crafts designers, including William Burne-Jones and Charles Ferguson. 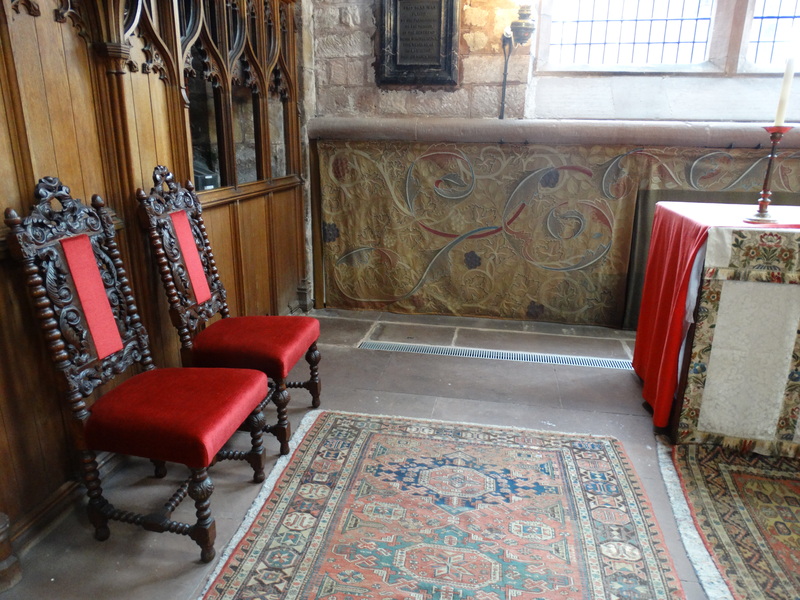 Behind the altar is this woollen embroidered Dossal by William Morris. 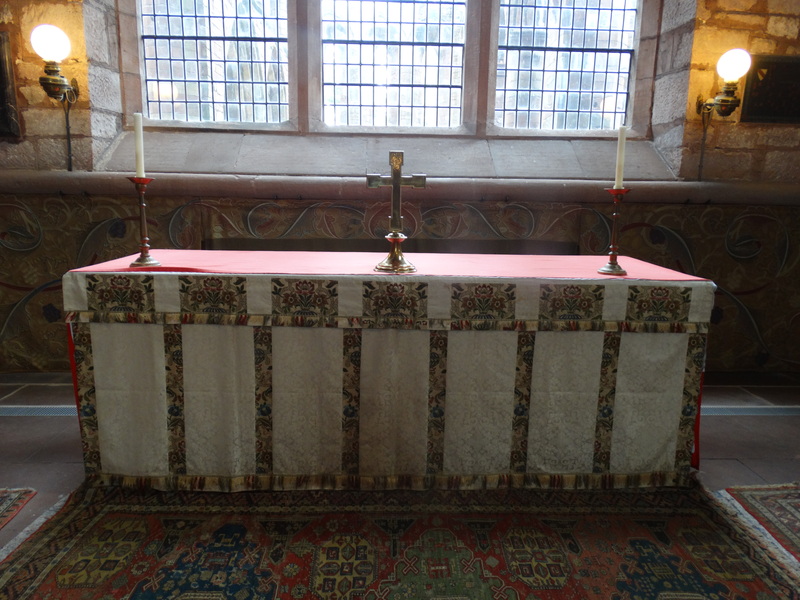 It was embroidered by Mrs Bulkeley, the wife of the then Vicar, and Mrs Dodgson and Mrs Chapman, wives of previous Vicars, and first hung in the Priory on Easter Day 1887. In 2013 they had a major restoration programme and have produced an excellent book on the subject (by Christine Boyce). If you are interested in William Morris, I highly recommend a visit to the Gallery in Walthamstow, north London – website. We went last year and had an excellent afternoon. 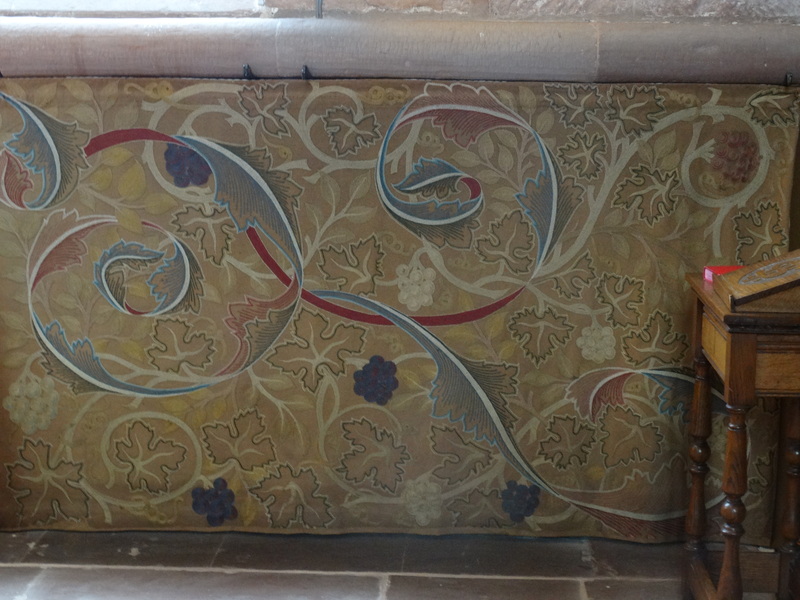 Back in Lanercost, the lady from the V&A described this Dossal as “a particularly beautiful and original design made by Morris for a friend at the peak of his career as a designer. 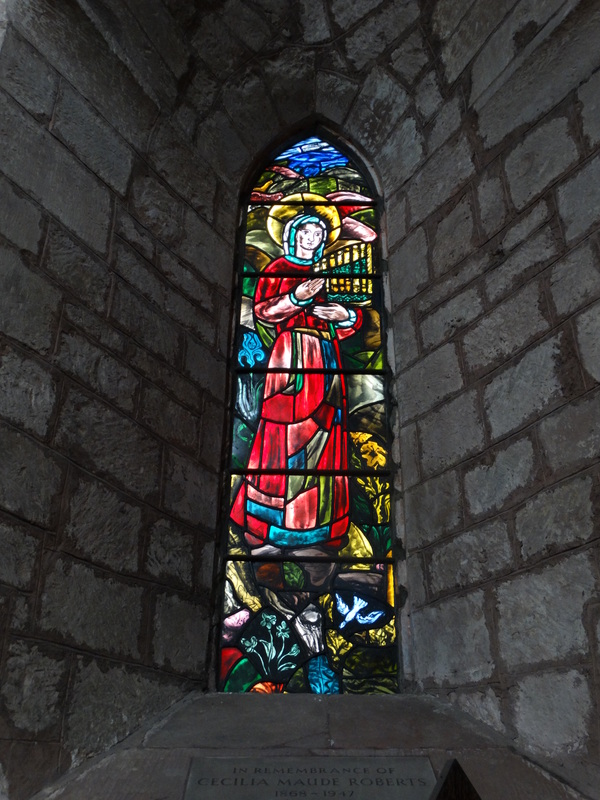 It is one of the few commissions remaining still in-situ.” In order to preserve it, the church has put a programme in place to protect the dossal from light, insects, mice and, to quote the book, “contamination by candle wax, spillage of communion wine and contact with decorative vegetation and water”. Those of you who work in churches will have alarm bells ringing – “no flowers or other vegetable matter should be permitted in the Sanctuary”. In the red corner we have the Dossal ladies, in the blue corner the Flower ladies – and the Vicar is probably caught in the middle!! 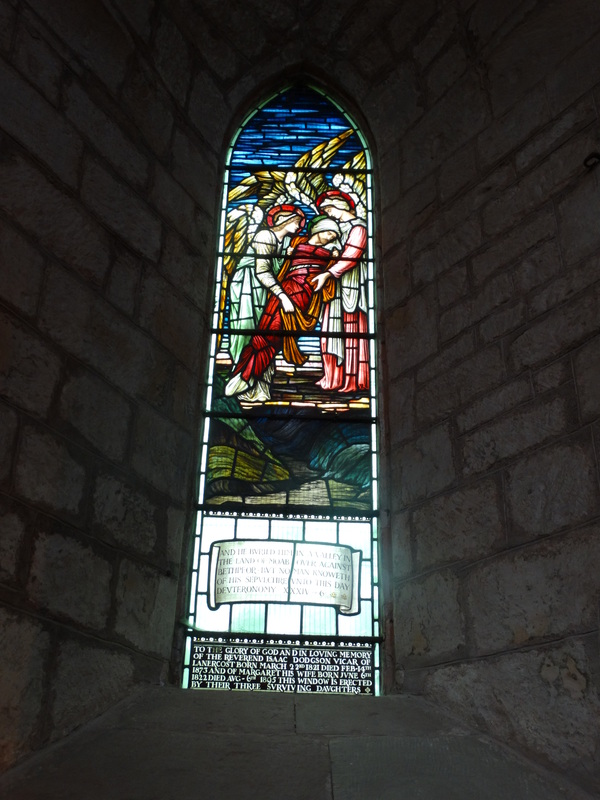 There are some lovely Arts and Craft windows as well – one of which replaces a former window, broken by a football during a kick-around involving the then Vicar’s sons. 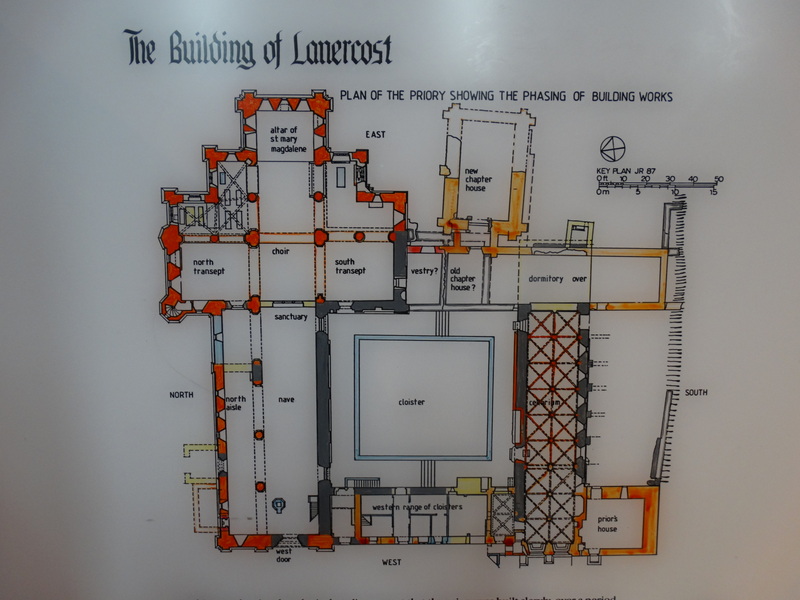 There are some good display boards about the Lanercost Cartulary – the original is in the Cumbria Record Office. 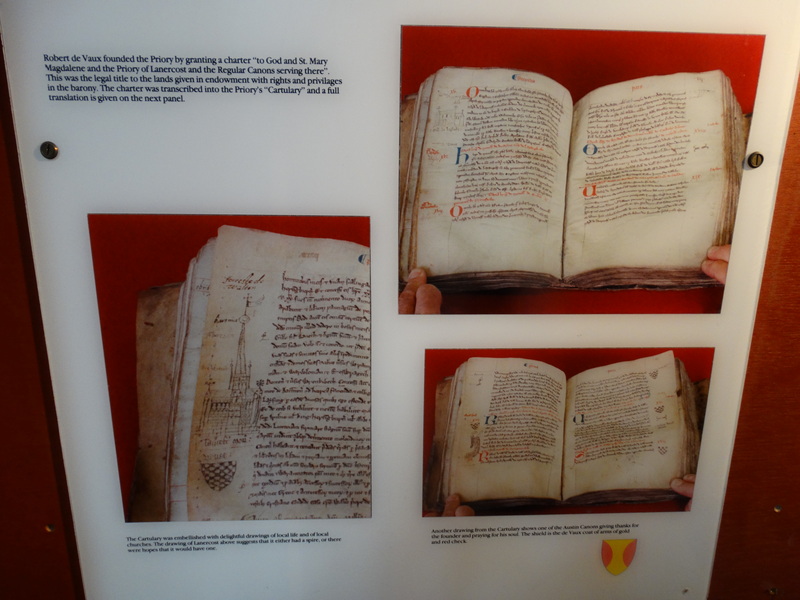 A cartulary is a book which contains copies of charters, recording grants or surrenders of land to the Canons. It was obviously much easier to look through a book than a pile of charters. 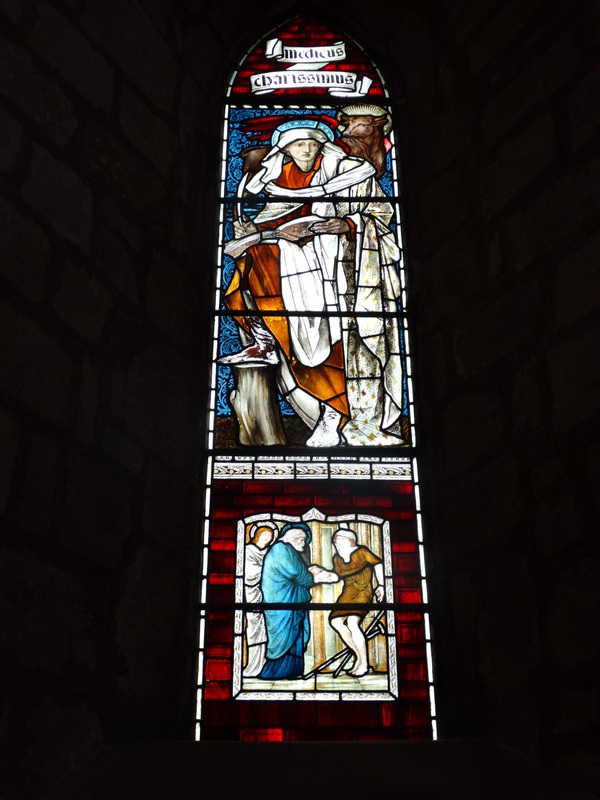 It was started between 1252 and 1256 either during or soon after a major battle in the courts with their own lord, Thomas of Moulton, baron of Gilsland. They lost that law suit, but were better prepared for any future ones. A single canon wrote the whole book, collecting charters from the previous hundred years. He up-dated it for a time, and different canons copied additional charters for another century. The last is dated 1364. There are lovely drawings in the margins, and these are reproduced in a little book “A Window onto Late Medieval Cumbria; the drawings in the Lanercost Cartulary” by John Todd. It is unlikely that the priory church ever looked like this. 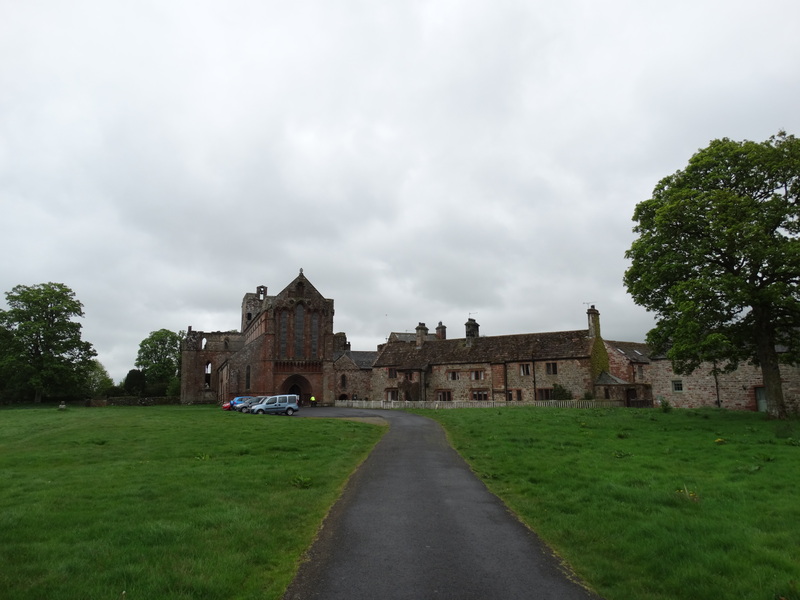 At the Dissolution the charters and cartulary went to the new owners of the land – the family at Naworth Castle. The cartulary was quoted in court in 1826, and then disappeared. There was a fire at Naworth in 1844 and it was assumed it had been burnt. In fact the registrar of the court in 1826 had taken it home – to Castletown House, north of Carlisle. It was re-discovered in 1982. The original charters were at Naworth until 1830 when the chief steward of the Howard estates called them to be sent to Castle Howard. They were taken by cart to the Tyne, loaded onto a boat, and the boat was wrecked on a sandbank in the Humber. The cargo was rescued, but since the ship had also been carrying Verdigris (acetate of copper) the documents were stained green or washed blank. They were then loaded onto carts, buried in a snowstorm, and when they finally got to Castle Howard were laid out along the galleries to dry – all sense of order and history was lost. By 1985 it was only possible to identify ten of the original Lanercost charters, out of the 360 or so that were copied into the cartulary. Before I make rude comments about aristocrats and their care for their records, it is worth reading this beautiful memorial. “In this church lies buried Charles Howard Fifth Son of George Sixth Earl of Carlisle also Mary his wife daughter of James Parke Baron Wensleydale, who died at the age of 21 after one year of married love. He mourned for her all his life finding his consolation in sincere and simple piety in unselfish and fervent love for old and young and in a single minded and ardent devotion to the cause of progress and liberty which cause he supported with unwavering steadfastness for 39 years as Member of Parliament for East Cumberland. He died beloved of all AD 1879 aged 65 years. Their son George Howard places this tablet in loving remembrance.” Even the aristocracy know pain. 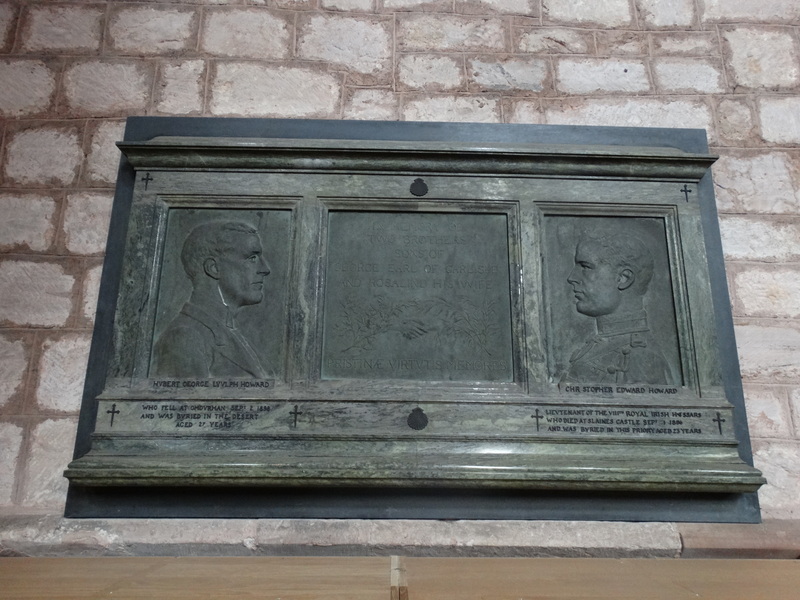 Here is another plaque, commemorating Hubert Howard and Christopher Howard, sons of George Earl of Carlisle and Rosalind his wife. One died at Omdurman in 1898 and the other at Slaines Castle in 1896. I am not going to do lots and lots of photos of the rest of the Priory, but here is a site plan to give you a flavour of all that is there. It is worth visiting. 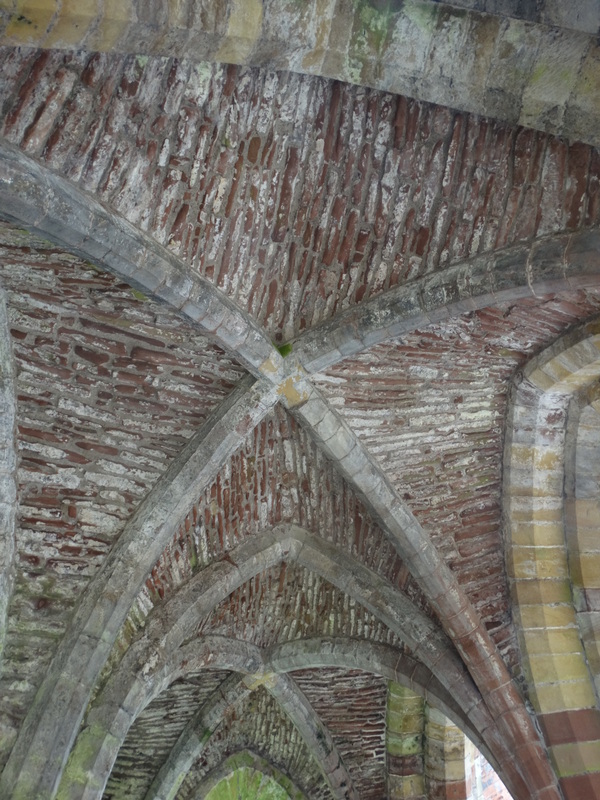 Beautiful stone – even better if the sun is out – some lovely vaults, and some fascinating tombs. 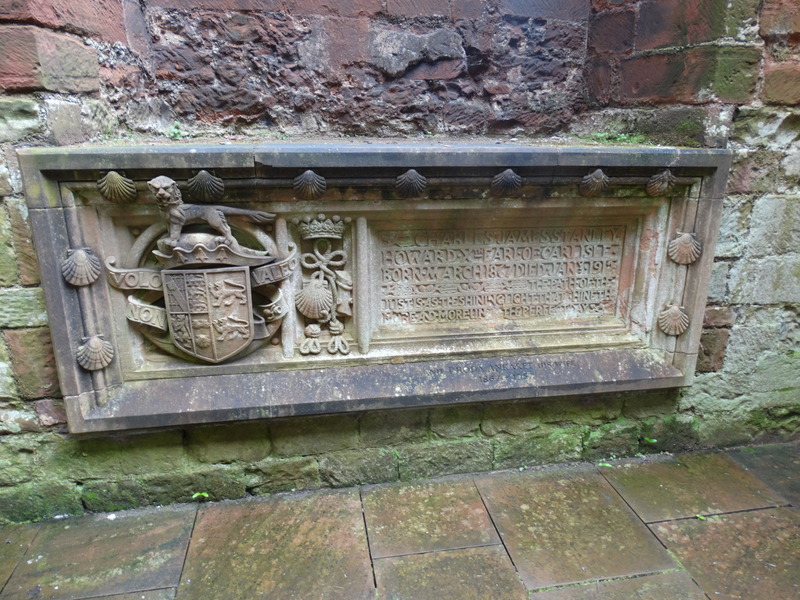 This wall-tomb and monument is supposedly of Sir Roland Vaux. 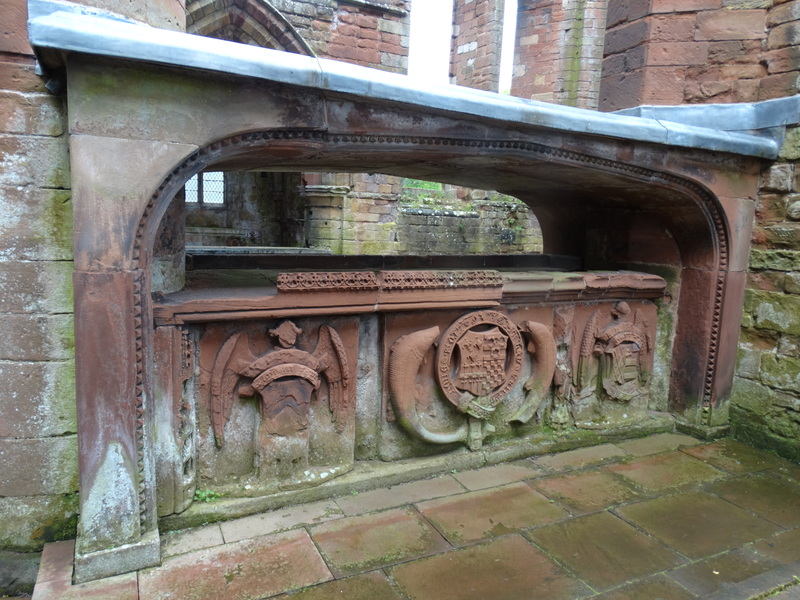 However he was alive in the C13, whereas the form and style of this tomb-monument suggest a date of 1350-1410. It is most likely to mark the grave of a member of the Dacre family. 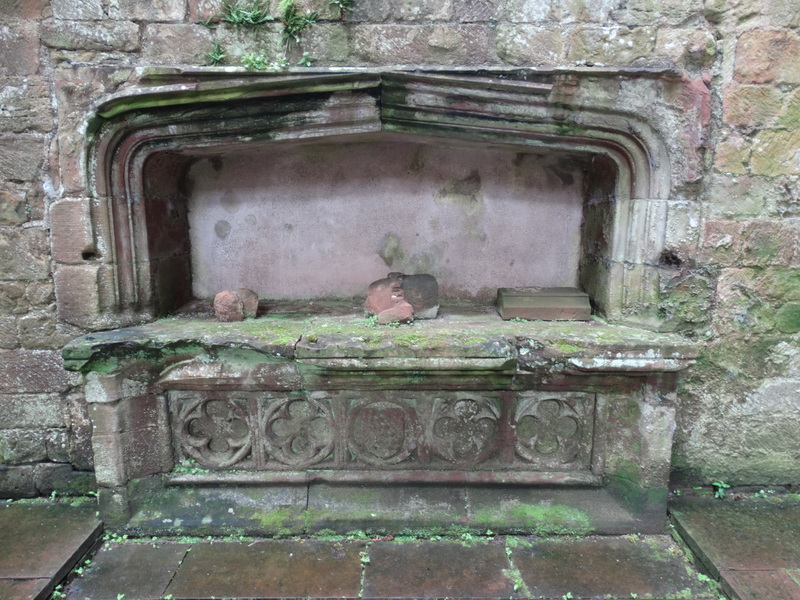 The Dacres were the patrons of the priory, so they are buried at the east end. 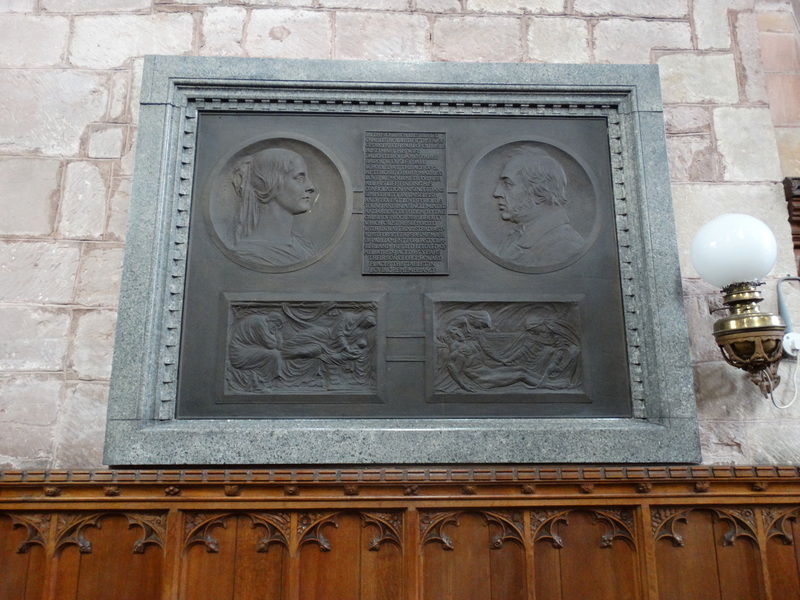 This is Lord Thomas and Lady Elizabeth Dacre – Lord Thomas had had an important role on the English side at Flodden, and died on campaign in Scotland on 24 October 1525. This one is slightly earlier, probably about 1510 – it is of Sir Humphrey and Lady Mabel. The baby is Elizabeth Dacre Howard, daughter of George and Rosalind Howard. She died on 17 July 1883 only four months old. 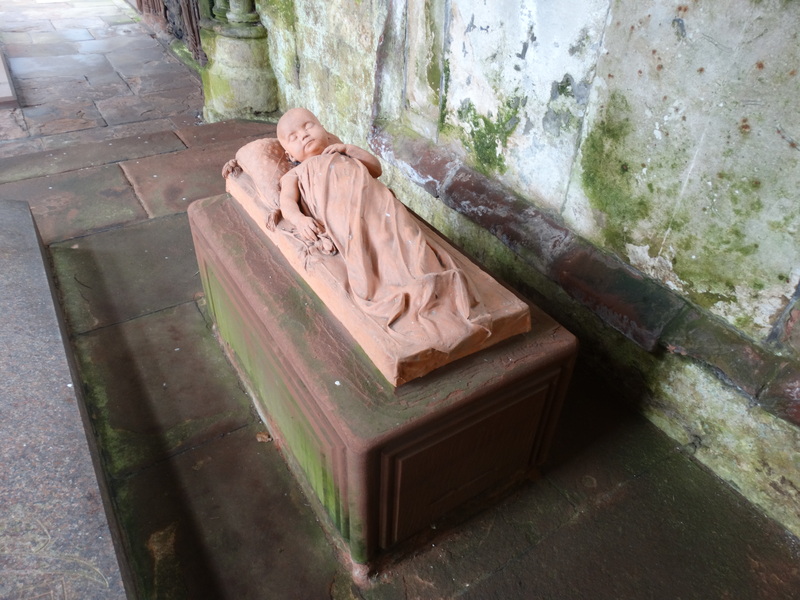 The terracotta effigy is by Sir Edward Boehm. 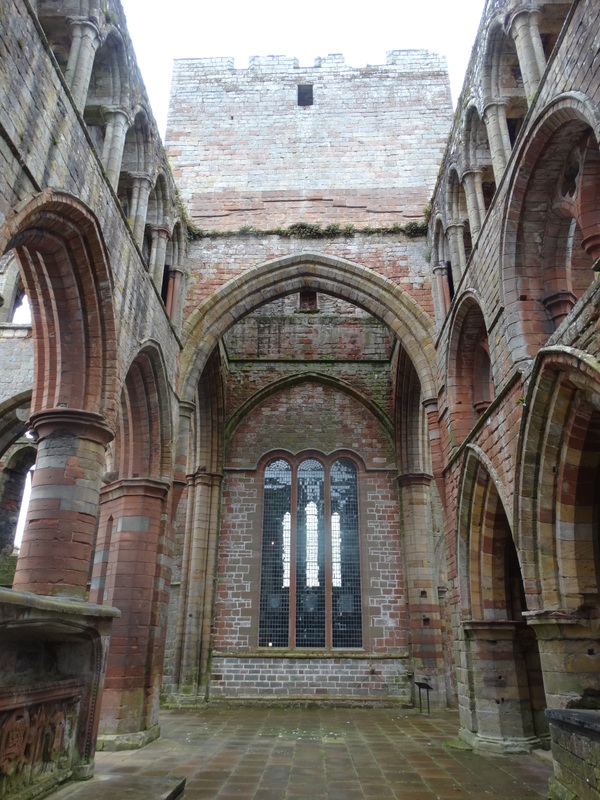 A sad image to end on – but rather nice that a Priory originally built in 1169 is still a holy place, despite all the Scots, the Reformation, and everything else can throw at it. OK, the ruins are owned by a charity, the feeding is done by a business, but the church is still there working with them all, adding a dimension of prayer and worship. This entry was posted in Cumbria, Outside Northumberland. Bookmark the permalink. I note your comment re the broken window, if it is the one I am thinking of it was broken by a cricket ball hit (according to family tradition) by my grandfather and namesake who was the 3rd son of 5 of Rev Henry John and Mrs Lucy Margaret Bulkeley, the vicar’s wife involved in the embroidery of the Dossal! ”accuracy”…. ”five years” – come on Peter, it is not even three years since you blogged about St Mary Magdalene! Hope the change away from Northumberland has worked out well for Julie and yourself.